Sealaska Heritage Institute (SHI) through its Scholarship Committee has chosen a well-known language advocate and assistant professor of Alaska Native languages as the 2016 recipient of its annual Judson L. Brown Leadership Award. The recipient, Lance Twitchell, has helped to lead a high-profile effort in recent years to revitalize Alaska Native languages. 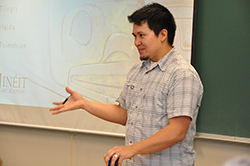 As an assistant professor of Alaska Native languages at the University of Alaska Southeast (UAS), he has pushed to develop Haida and Tsimshian language classes; to create systemic changes in the university, our communities and organizations; and to increase attendance in language classes. In his first two years at UAS, attendance in Alaska Native language classes rose by 150 percent. He also was a key member of a team that secured passage of House Bill 216, which made Alaska the only other state in the U.S. to officially recognize its indigenous languages. The $5,000 scholarship goes to students who have demonstrated academic achievement and leadership skills, said SHI President Rosita Worl, adding only one person wins the annual award. In 2015, Twitchell was accepted into the Ph.D. program in Hawaiian and Indigenous Language and Culture Revitalization at the Ka Haka ‘Ula O Ke’elikōlani (College of Hawaiian Language at the University of Hawai’I at Hilo). SHI also administers a scholarship fund for Sealaska, which announced that nearly $416,000 in Sealaska scholarships were issued this year.